It is quite dangerous to grow up in Somalia. 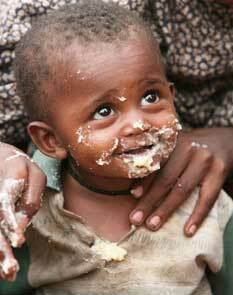 There are many serious obstacles for children to overcome (violence, poverty, malnutrition, etc.). In Somalia, the dry climate and political instability make it one of the most difficult countries in which to survive and for children it is even harder. 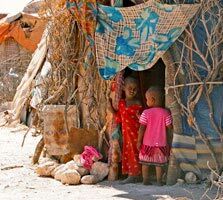 According to the statistics, 60% of Somalis live below the poverty line, meaning they make less than 2 dollars per day. Somalia is one of the poorest countries in the world. 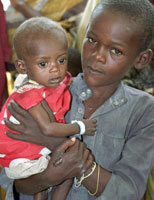 About 40% of children suffer from malnutrition in Somalia; 33% only eat once a day. Farming is the most common occupation in the country but droughts and floods, as well as war, don’t allow for sufficient crop production. Almost a third of newborns suffer from low birth weight. The lack of prenatal care and education for mothers is often the cause. In this country, only 9% of babies are breastfed exclusively. Campaigns to promote breastfeeding are essential in Somalia to reduce the cases of malnutrition and infant mortality. Breastfeeding brings essential nutrients to the baby and greatly reduces the risk of serious illnesses, like pneumonia. Somalia is a particularly arid and hot country. In this hostile climate, access to water is vital, but only the north and south receive adequate rainfall. Water shortages are, therefore, common. Many children spend most of their day looking for water and then carrying the heavy load many kilometers home. Diarrhea and other epidemics are common since the water used is not always clean. Many children die each year from dehydration. The infant mortality rate is especially high in Somalia, with an average of 180 deaths for every thousand births. Somali children typically die from dehydration and illnesses like diarrhea, malaria, and pneumonia (or other respiratory infections). Cholera epidemics occur every year. To reduce this mortality rate, it is crucial to increase access to potable water and nutrition as well as improve the population’s hygiene. Access to medical care also must be improved. There are few hospitals in Somalia, and most of them lack equipment and trained staff. In the last few years, massive vaccination campaigns have taken place regularly, mostly for polio, which has already saved many lives. For many years, Somalia has been ravaged by a particularly violent civil war. Children are a large part of the victims. In Mogadishu, the capital, there are still armed conflicts and terrorist attacks every day. Hospitals in the capital are, in large part, filled with children who have been hit by bullets or who have been handicapped as a result of a mine explosion. Due to this conflict, thousands of Somali families have fled the country. There are approximately 1.4 million displaced people in the country and 600,000 Somalis living as refugees in Kenya and Yemen. These refugees live with their children in poorly supplied camps. An estimated 2,000 to 3,000 children, sometimes as young as 9, are currently enlisted in the Somali armed forces. According to Unicef, the situation is currently getting worse because the militia have transformed schools into recruitment centers and forced teachers to turn their students into soldiers. Fearing that they will be recruited, certain parents even prefer to separate from their children and send them to refugee camps on the country’s border. In Somalia, about three fourths of children don’t go to school. Only one out of four adults knows how to read and write. Many schools have been destroyed since the civil war in 1991. Most schools are now located in cities. This prevents access for many students who live in the countryside. Additionally, most families don’t have the means to pay for school costs. For girls, the chances of getting an education are even smaller. It is estimated that only a third of students in schools are girls. Many girls leave school when they get their first period or when they marry, which often happens before the age of 15. 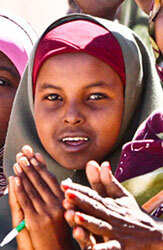 Even today, more than 90% of young Somali girls are submitted to the most painful circumcision surgery: Infibulation. This means that the entire genital area is sewn shut, apart from a tiny orifice to allow for urination. Girls are subjected to this mutilation between the ages of 4 and 14. The circumcision takes place without the use of anesthesia, most often with a razor blade or a non-sterilized knife. About one out of ten girls die as a result of blood loss or infections caused by this operation. In Somalia, there are no national laws prohibiting this practice, despite its extreme detriment to women’s health. Most girls do not resist due to social pressure and a lack of education on the subject. Between 2000 and 2009, 45% of young women admitted to being married before the age of 18. Arranged marriages, often unknown to the future couple, are very common. 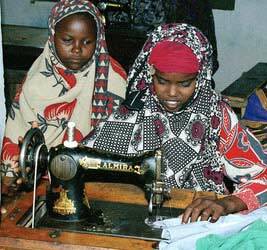 Some girls run away from their families to escape this situation, which is highly disapproved of in Somali society.